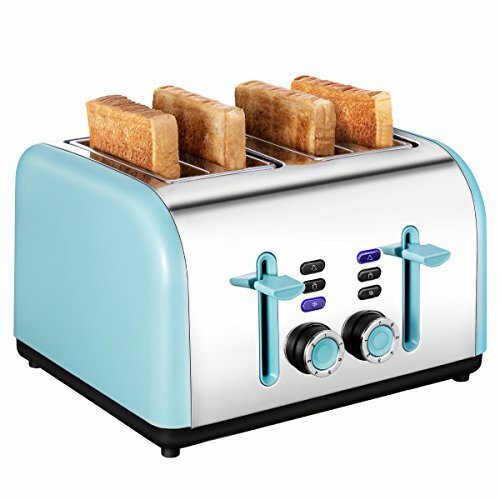 4 slice toaster comes more convenient than 2 slots, make you actually have toast WITH the family instead of making toast for everyone. Sleek and modern looking while still compact enough to easily slide on your counter. Quickly toast and cook fully trough your bread. With dual independent control, this 4 slice toaster makes you defrost your frozen foods at 6 level meanwhile reheating at 5 level on the other side. Smooth and easy to press down, securely in place with solid feel, will not release on its own. Raise your bread enough, with Keemo kitchen toaster, you won't have the need to go fishing for your bread with a knife or fork. 1.5*5.8'' long wide slots accommodate bagel, hamburger bun, wide toasted bread and longer pieces of bread. Time may vary according to different situations. ★EVENLY & FAST TOAST: 4 slice toaster browns bread evenly on both sides, top to bottom and in all four slots. Toasts quickly while fully though within 260s (at 7 level), bread toaster is convenient for a family of four. ★WIDE SLOTS: With dual independent control panels, kitchen toaster has separate settings to allow for individual tastes. 1.5*5.8'' long wide slots accommodate bagel, hamburger bun, wide toasted bread and longer pieces of bread. ★DURABLE LEVER: Keemo 4 slice toaster features CANCAL, REHEAT, DEFROST functions. Cancel function allows you to stop the bread toaster while working, which is safer. 7-level adjustable browning control. Durable lift lever with smooth movement lowers and pops up the toast sufficiently. ★STYLISH & SAFE: FDA approved. Sleek, solid and modern looking, 4 slice toaster is compact enough to easily and nicely slide on counter. Cool to touch chrome stainless steel finish that resists rust, plus 2 separate removable trays, all make the bread toaster easy to maintain. ★1 YEAR WARRENTY: If you received a defective item or not satisfied with this products, before post the feedback or review, please contact us. We will try our best to help you, satisfying all your reasonable needs. Thank you for kindly support. Happy shopping!